This is a brand-new arrival from Brazil … and imagine my surprise when I discovered a whole new starbrary! 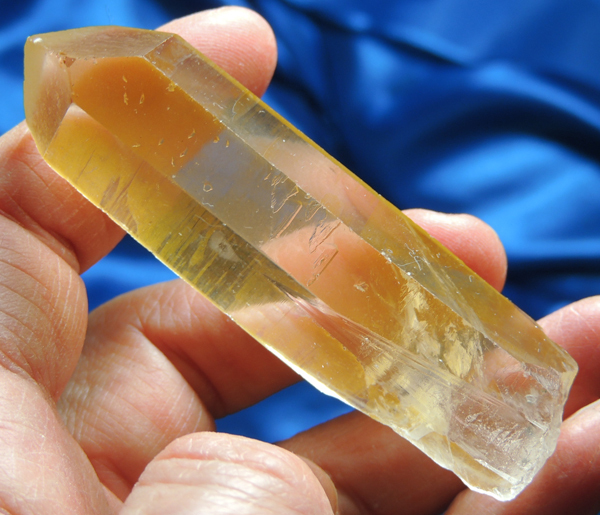 This is a 1.7 oz, 2.95” by 0.8” by 0.7” amazing golden quartz with a few keys around her base. She has a Dow termination and the faces are subtly glyphed and bear a number of record keepers … a loupe will help you see them as they are subtle. The sides are covered with starbrary glyphs. Most all of the starbraries only have glyphs on every other side … the Libra has glyphs on all sides (although very subtle on two) and even in bas relief in the keys! The glyphs are varied and yet sweeping … somewhat like a Cassiopeia but much more detailed and intricate. Her color is a rich gold, leaning just a hair towards orange. She is simply extraordinary and her messages are awaiting her special Keeper! There are some tiny-tiny dings along the facial edges but nothing of significance. Libra starbraries are new … and the messages bring a sense of balance. We love to think of the world as divided as is the yin and yang where there is a clear division between the two. Unfortunately, you can’t live like that … life exists on the line between them where there is a balance between the two. Future must be considered and balanced with the past. Technology is a wonderful thing but its effect on our lives must be realized as not all technology has a positive long-term effect. Native Americans call it “seventh generation” where every decision must show the effect on succeeding generations. Such is the message the Libra Star Peoples brought and it is one that is even more important today. The appearance of the Libra starbrary is not only timely but critical.